New York Painting Services is a full service painting contractor that supplies commercial businesses and residential homes with a number of services in the Greater New York and New Jersey areas. We are completely licensed and insured to provide our professional expertise and services to the community at affordable rates. New York Painting Services is committed to bringing our valued customers with phenomenal experiences, which is why we incorporate friendly customer service, traditional values and work ethics, and superior workmanship. Our technicians are more than qualified to perform our services; having the knowledge accumulated from training, know-how from field experience, and remarkable skills that come to naturally. 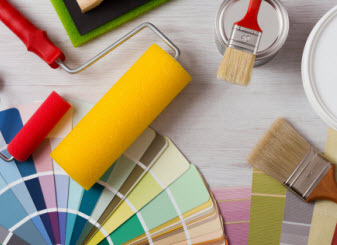 New York Painting Services utilizes high-end products, materials and equipment that are exclusive to licensed professionals to ensure maximum results. New York Painting Services goes the extra mile with customer service for our commercial and residential customers throughout New York and New Jersey by including online assistance. With our wallpaper and wall covering glossary of terms and phrases used in the industry, you can have a clearer picture of the various procedures and services we offer. American Single Roll: A single roll of wallpaper that measures 27″ inches wide and 4 1/2 yards long. 	– The paper expanding on the wall after installation because of inadequate soaking or booking time. 	– During installation any air that has become trapped between the wallpaper or border and the wall. 	– Aeration of the adhesive paste. Bolt: Equivalent to two or more single rolls packaged together a bolt is a continuous roll of wallpaper. Booking: Also referred to as the relaxing period, is the process of folding void of any creasing, a recently pasted or wetted strip of wallpaper or border, with pasted sides together. This process prevents the paper from expanding on the wall, creating blisters or air bubbles and allows the paste to soak into the wallpaper backing. Cellulose Paste: Cellulose paste is a non-staining and odorless adhesive, which is typically used hanging natural materials such as grasscloths, linens, silks, stringcloths, and especially murals. Clay-based Adhesive: Clay-based adhesive; heavy solids of a starch origin that enhance its adherence ability and is generally used for heavier papers. It will have the potential and likelihood to stain and can cause the ink to flake from many types of wallpaper and border. Cross Seaming: A technique where a wallpaper liner is installed horizontally and the decorative wallpaper is installed vertically. The results are more secure adhesion and ensure that the seams do not fall in the same. Dado: The area of a wall from the baseboard to the chair rail; traditionally equal to 1/3 the height of the wall. De-lamination: Often caused by excessive soaking or booking times, this condition occurs when the backing of the wallpaper or border begins to separate from the vinyl facing. Directional Print: A pattern on wallpaper or border that requires a specific installation and direction in order to be aesthetically pleasing. Double-Cutting: A technique to obtain perfectly fitted seams; done by overlapping one strip of wallpaper over the other until all patterns are perfectly matched. Afterwards, a sharp blade is used to cut through both layers and the excess edges are removed. Double Roll: A continuous roll of wallpaper equivalent to two single rolls. The double rolls are packaged this way to give you more usable wallpaper with less waste during installation. Drop-match: Also referred to as half -drop match, it is a pattern match in which every other strips of wallpaper that is installed; having the same pattern design at the ceiling line. This forms a diagonal pattern sequence as opposed to a horizontal pattern. Gapped Seam: Gapped seams are a small space that appears between strips of wallpaper that are hung side by side; often the result of poorly prepared walls or excessive pressure being used during the installation process. Laminated Wallpaper: Laminated wallpaper is wallpaper or border that has a decorative surface with a backing that is bonded to usually paper or fabric. Linear Feet: Pertaining to the length measured by the distance between two points; used in reference to the measurement length of height of a wall, the length of a strip of wallpaper, or the length of a piece of border. Liner Paper: A thick, vinyl wall covering that is installed under the decorative wall covering. Matching: The technique of joining two strips of wallpaper to ensure partial designs or a sequence of designs will line up properly. Matte Finish: A matte finish, sometimes referred to as a dull finish, is a finish on the wallpaper or border that has very little to know shine or reflective qualities. Murals: A single picture or scene with no repeats. Murals often or specifically packaged in panels that when installed properly, they form a scene. – Wallpaper that has been overworked during the installation process. Peelable Removable: Wallpaper or border of which the front and middle layers can be stripped away, exposing the backing material to make removal easier. Pigmented Primer/Sealer: A primer or sealer that dries white instead of clear is a pigmented primer or sealer and is designed to help block out discolorations or spots on the wall. Pre-Pasted: Wallpaper or border that is pretreated with an adhesive sprayed or coated on the backing. This adhesive is water-soluble which is activated by soaking the wallpaper or border in a water tray or bathtub as installation is performed. Primer/Sealer: Primer/sealers absorb into a porous wall surface and are typically alkyd or acrylic-based liquid that is applied to the wall prior to wallpaper installation. 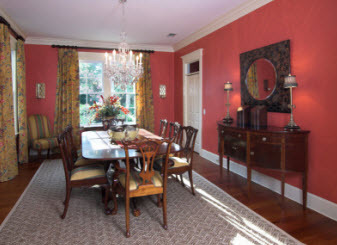 Railroading: The technique of hanging wallpaper horizontally instead of vertically, which is often done above windows and doors. Scoring Walls: Scoring walls is a technique used for wallpaper removal by sanding, scraping or etching the vinyl surface of a wallpaper or border. Scoring allows the removal solution to reach the paper backing of the wallpaper or border and dissolve the adhesive. Single Roll: American single roll is 27 inches wide and 4 1/2 yards long, covering approximately 27-30 square feet of area. Sizing: Prior to wallpaper installation, sizing is a liquid mixture that is applied to the wall to. Solid-Sheet Vinyl: A type of wallpaper or border that has a paper or fabric backing laminated to a solid vinyl facing. Strippable Wallpaper: Strippable wallpapers remove both the cover and backing at the same time making it easily removed without damaging the wall. Un-pasted Wallpaper: Wallpaper or border that has not been pre-pasted at the mill prior to packaging. Untrimmed Wallpaper: Wallpaper in which the selvage edges have not been removed at the mill prior to packaging. Usable Yield: The quantity of wallpaper that is actually installed on the wall; not including the waste due to pattern match or allowances. Wainscoting: Paneling or woodwork that covers the area from the baseboard to the chair rail, usually about 1/3 of the entire wall height. 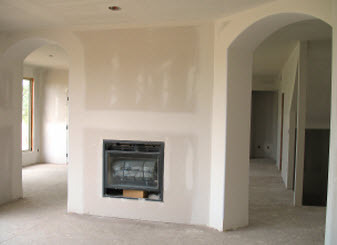 New York Painting Services offers quality painting related services. Contact us to learn more.